Ibiza Airport is the only airport serving the Balearic Islands of Ibiza and Formentera, with numerous seasonal and a few year-round international and domestic flights. Our guide to the airport is a useful resource for travellers, containing information regarding terminal facilities, public transport access and nearby accommodation options. There is an airport information desk (tel: +34 913 211 000) at check-in. A Passenger Service Office (tel: +34 971 809 207) can also be found in the check-in area. The Ibiza and Formentera Island Council also operates a tourist information office in the airport's arrivals area (tel: +34 971 809 118). From Ibiza Town, take the PM-801 road westbound and turn southbound onto the E20 (Ibiza-Airport) motorway. This road leads directly to the airport. The total drive time from Ibiza Town to the airport is approximately 10 minutes. Ibiza Airport is located 7km (4.5 miles) southwest of Ibiza Town. Bus: The Ibiza Bus (tel: +34 971 340 412; www.ibizabus.com) route 10 runs between the airport and Ibiza Town (journey time: 30 minutes), while bus 9 operates to San Antonio (journey time: 45 minutes). Seasonal services operate to other areas of the island. There is a bus information telephone line in Arrivals for further information. Taxi: The airport keeps a permanent fleet of taxis available however if there is non available you can contact Radiotaxi de San José (tel: +34 971 800 080) offering taxi services to the centre of Ibiza (journey time: 20 minutes), Playa d'en Bossa, San Antonio, Santa Eulària, San José and San Juan. 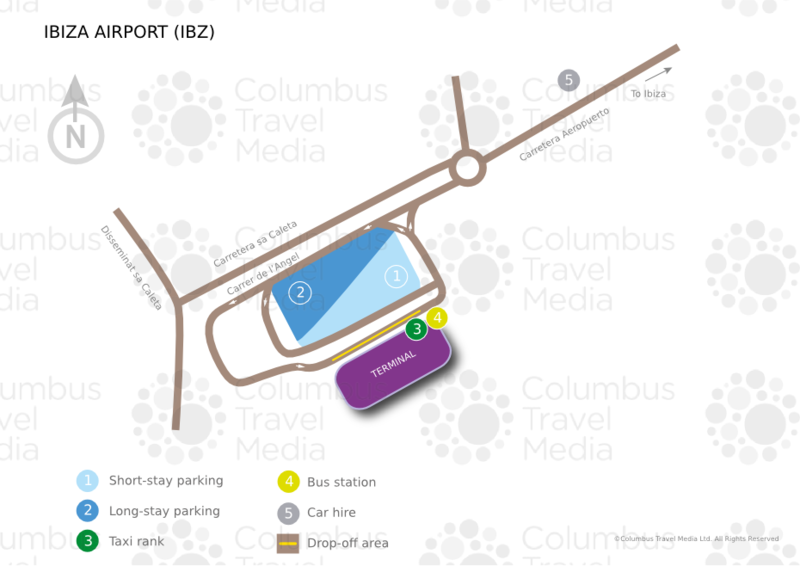 The taxi rank is located next to the terminal. Water: There are regular ferry crossings (tel: +34 966 428 700; www.balearia.com) from Ibiza Town to Formentera (journey time: 30 to 60 minutes). Further information on prices and schedules are available from the airport's tourist information office. ATMs and banks are located in the public area of Arrivals. Visitors to the airport can choose from fast-food outlets, bars, restaurants and cafés; the majority of which are situated in the post-security departures area. Most of the airport's shops are located on the first floor (Departures) after security; among the options are a large duty-free outlet and a shop selling merchandise from some of the large nightclubs on the island. There are no left-luggage facilities at Ibiza Airport. A Lost Property Office (email:ibizaob@aena.es) is situated on the first floor. Other facilities at Ibiza Airport include defibrillators and a pharmacy. The airport also has a VIP Lounge. The airport offers its Modular auditorium (tel: +34 971 809 244) for business meetings and events, with capacity for 80 people and 40 computers. More extensive and intimate business and meeting facilities are available at some of the island's larger hotels, as well as at the Ibiza Convention Centre (tel: +34 971 336 406; www.ibizaconventionbureau.es) in Santa Eulària, a 25-minute taxi ride from the airport. Free Wi-Fi internet access is available throughout Ibiza Airport. Additionally, there is a post box on the ground floor, near check-in. Ibiza Airport is accessible to physically disabled passengers, with lifts, lowered pavements, adapted telephones and specialised toilets among the offered facilities. There are several dedicated parking spaces for disabled travellers in the airport car park. Taxis for disabled passengers are also available from Radiotaxi de San José (tel: +34 971 800 080). There are almost 500 parking spaces at Ibiza Airport. Cheap tariffs are available for both short- and long-term parking. For further information contact the airport's information desk (tel: +34 913 211 000). Car hire companies: Avis, Enterprise, Europcar and Hertz are represented at the airport, with offices located in the arrivals hall.